Elephone in time past alongside the other Chinese OEMs are known to be a master cloner when it comes to high-end flagships from the likes of Samsung. 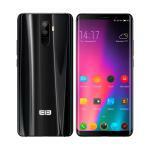 It’s new offering, which is the Elephone U Pro was released alongside a lesser variant Elephone U and offers quite a number of interesting features. This is a top shelf mid-range smartphone as it comes with not just a nice looks but packs some interesting features too.